Applicants for a clerical job in North Carolina have been asked to provide their usernames and passwords for Facebook and any social networks they belong to. 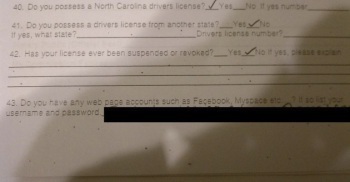 It's not unusual for companies to check out Facebook sites of potential employees, but a police department in North Carolina took it one very disturbing step further by not only asking applicants for a clerical job whether they had a Facebook or MySpace site, but also demanding the usernames and passwords necessary to access them. It's an outrageous demand - you wouldn't let a prospective employer come over to your house and root around in your medicine cabinet or underwear drawer, after all - and I have a hard time believing it's even legal to demand that kind of information in the first place. It's one thing to search the internet for publicly available information, but quite another to demand that people hand over the keys to their kingdom and deny them employment if they refuse to do so. On the other hand, what's legal and what's done are often two entirely different things, and if enough people just roll over for this and fill in the blanks without question, it could eventually become a common, or at least tolerated, practice. It may sound unlikely, but consider the words of former News of the World deputy editor Paul McMullen, who very likely summed up a widespread contemporary attitude toward privacy in his testimony at the Leveson Inquiry yesterday. "Privacy is for pedos," he said. "Fundamentally, no one else needs it." Something to bear in mind the next time you're annoyed about having to deal with online privacy settings - and when you're thinking about just how much personal information you want to put out there for the world to see.